The United States of America is one of the world's oldest football nations but is almost unique in the sporadic nature of its historical narrative. The US Open Cup is the second oldest cup competition but is the only thread that links the first days of American soccer to 2013. The professional league structure's tale is one of fits and starts, the highs of Major League Soccer and the North American Soccer League weaved through the lows of failed projects and outright oblivion. Some cities and regions have stronger associations with the wider history of American soccer than others. New York - the city and the state, along with neighbouring New Jersey - is a bubbling point of origin for a variety of teams and leagues over the years, so often the epicentre of the sport's rumblings on the eastern seaboard. Nearby Baltimore and Philadelphia have played big roles of their own. Pennsylvania's Bethlehem Steel is known for its part in the development of occupational motivation theory but was also home to one of the USA's most famous clubs of the 1910s and 1920s, honoured this season with Philadelphia Union's third kit. The team's great rivals, Fall River Marksmen, enjoyed success in the 1920s but were affected by the economic circumstances at the turn of the 1930s and were moved to New York and then back before folding in 1932. Baltimore's brief association with NASL comprised two teams, a handful of seasons, a winding-up and a move to San Diego, but the city's soccer reputation was built by the Orioles, Americans and Baltimore Soccer Club long before the Bays and Comets of the 1960s and 1970s. Today, the Pacific Northwest is considered another soccer heartland, feeding off the Cascadia rivalries between teams in Seattle, Portland and Vancouver. But the sleeping giant of American soccer is not, perhaps, an under-achieving MLS city or even the soon to be revived market in Florida, but St Louis. The modern international football supporter knows all about Portland Timbers, and New York Cosmos, and even Bethlehem Steel, but St Louis really isn't on the radar for many of us, primarily because the city has rarely had more than a sniff of involvement in MLS since the first ball was kicked in April 1996. AC St Louis, inaugurated by controversial MLS ownership hopeful Jeff Cooper and briefly managed by one Claude Anelka, folded in 2011 after playing just one season in the relaunched NASL. But back in 1971 St Louis was flying the flag for America in American soccer. NASL was still dominated by foreign players, and still played four of its 24 matchdays against clubs from abroad. Teams from Scotland, Italy, Greece and Brazil had their say in a season significant in part because of the debut of one of the best known football clubs on the planet: New York Cosmos. The league reportedly had just 16 native-born Americans in its ranks, bolstered by overseas players, naturalised Americans and players with dual nationality, and while other teams focused elsewhere it was St Louis Stars who put their faith in 14 of those 16 players. Pat McBride was born in St Louis and is a long-time supporter of soccer in the city, and he missed just two of the Stars' 24 matches in the 1971 NASL season. He played almost 200 games in total for the Stars in a one-club career that ran from 1967 to 1976, picking up five USA caps in the process. Prior to the 2006 World Cup, McBride was asked why St Louis was no longer a powerhouse of American soccer. The lack of a soccer-specific stadium is a problem, he said. He also praised the ongoing support of former Anheuser-Busch executive Denny Long, indicating that a genuine benefactor could be St Louis' key to a return. Despite being liberally seasoned with the taste of bonafide American, the Stars in 1971 were a team that benefited from the influences of their foreign players. 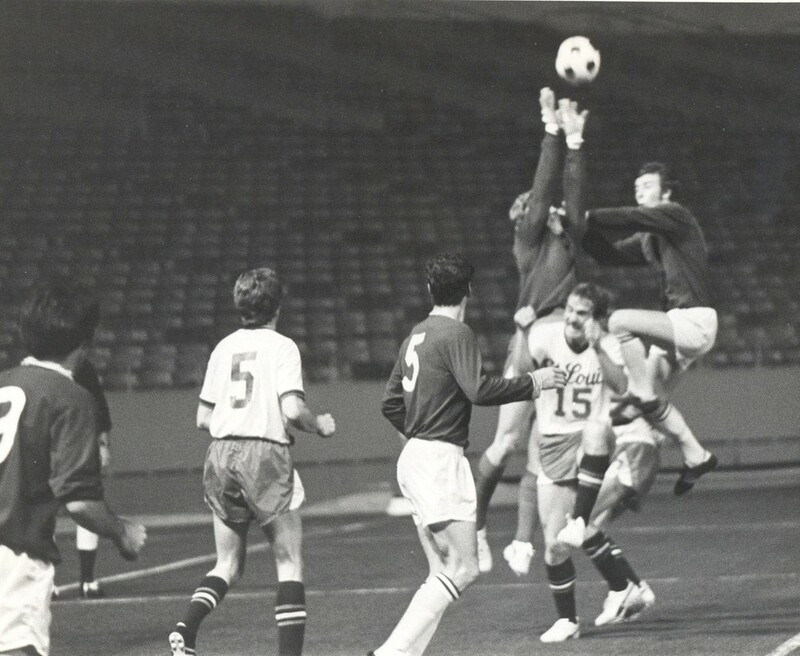 Dragan Popovic, known in America as Don, was born in Montenegro (then Yugoslavia) and turned professional at 17, playing for Red Star Belgrade and Hajduk Split before joining the Stars in 1968 for the first season of the NASL. He played for Kansas City Spurs briefly but, when they folded after the 1970 campaign, he returned to the Stars for the 1971 season, his last in NASL before a move to Canada. In 1971 he was St Louis' only representative on the NASL All-Star team. Kazimierz "Casey" Frankiewicz, a Pole, finished the season as the league's third highest goalscorer and also the third on "points", that most American combination of goals and assists. He played over 100 games for the Stars between 1967 and 1973 and even coached the team in '72 and '73, winning the NASL Coach of the Year award in 1972. Frankiewicz was one of two Stars ever-presents in 1971; the other, Steve Frank, played for the Stars for six years and won an international cap for the USA but went on to a career in business. German-born Willy Roy is more closely associated with soccer in Chicago - where he began and ended his professional career - but he joined the Stars in time for the 1971 season. He enjoyed an excellent goalscoring record during his international career, scoring ten goals in just 20 appearances for the USA. But there was a problem: in 1971 the Stars were not very good. They finished bottom of the Southern Division having won just six matches, and had to look on as second-placed division rivals Dallas Tornado defeated Northern Division winners Rochester Lancers (again guided by Carlos Metidieri, who became the only player ever to be the NASL MVP and top goalscorer in consecutive seasons - his "double double") and then Southern Division winners Atlanta Chiefs to win the championship by way of the new-look post-season playoffs. Of the season's three expansion teams, each of which paid a fee of $25,000 for the honour of participating in NASL, it was the Cosmos who made the strongest start, losing out to the Chiefs in the playoffs. Montreal Olympics and Toronto Metros - both blessed with their fair share of native-born Canadian players - missed out on the post-season, but neither fared as badly as a Stars side whose American flavour barely flickered over the palate of a season that is more commonly recalled as the first for the Cosmos. For the team playing under Gordon Bradley at Yankee Stadium in 1971, the best was yet to come. Chris Nee is an IBWM content editor and is the editor of The Stiles Council. He also hosts Aston Villa Review and The Stiles Council Podcast.